Our client came up with a great idea and iBeacon. This concept was very unique and the goal of the application was to advance the host and visitor interaction by using advanced beacon technology. VZ Pass is a mobile application which is connected through iBeacon technology. The application structure is very different as every company can purchase the subscription from the website in order to make the mobile app available for their users. 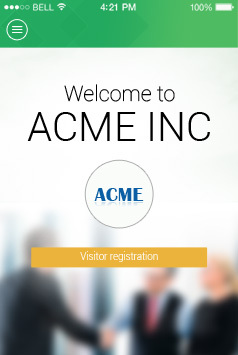 The application allows visitors to register and choose host to schedule a meeting. Hosts can register/login too in order to pre-register expected visitors. Hosts will get notified upon arrival of visitors and they can accept/reject/forward the invitation in order to interact with visitors. Visitors will get the notification whenever the host will accept/reject /forward the meeting. Also visitors can sign over the application in order to get the printed Visiting Pass and to attend the meeting with hosts. When the application reach to the proximity of the beacon it sends notification to the application as well. The application has a strong backend which is managed by admin of the company/organization. The application structure is very different as every company can purchase the subscription from the website in order to make the mobile app available for their users. One of the biggest challenge was at the backend is to create multi-tenant architecture and to establish connection between iBeacon and mobile application. Regarding the technology, team is facing some challenges in support as iOS and Android have different levels of support for iBeacons. Our client provided us ibeacon which was great help at the time of development and testing. 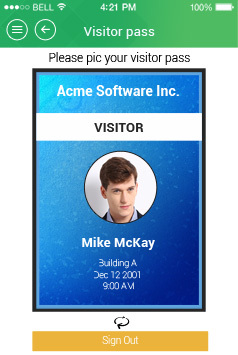 The team has successfully implemented the features like notifications alert and signature functionality which facilitates visitors to sign over the application in order to get the printed Visiting Pass and to attend the meeting with hosts. The team has been continuously worked hard in order to deliver the application as per the scope of the project. We deployed dedicated team to provide timely reporting by an account manager, project manager, senior designer, HTML developer, senior developer, a business analyst and a testing engineer. Flexsin has delivered an application which is unique and new as per the market trends and technology. The Client is much satisfied with the progress of the application as are developing the application which is in line to the expectations of the Client.